Very, very close to where I work lies one of Pune's iconic landmarks that one should plan for whilst they're on a visit in the city. This landmark is nothing more than a near-dilapidated old Irani cafe called Vohuman Cafe. It's got quite a small little space filled up with plastic round tables and chairs, a few counters for display here and there and nothing much else. The owner (known to be both cheery and nasty at the same time) takes charge from the cash counter which is right at the entrance. Seated, he greets familiar faces, hurls orders to his staff and carries out the cash exchanges. 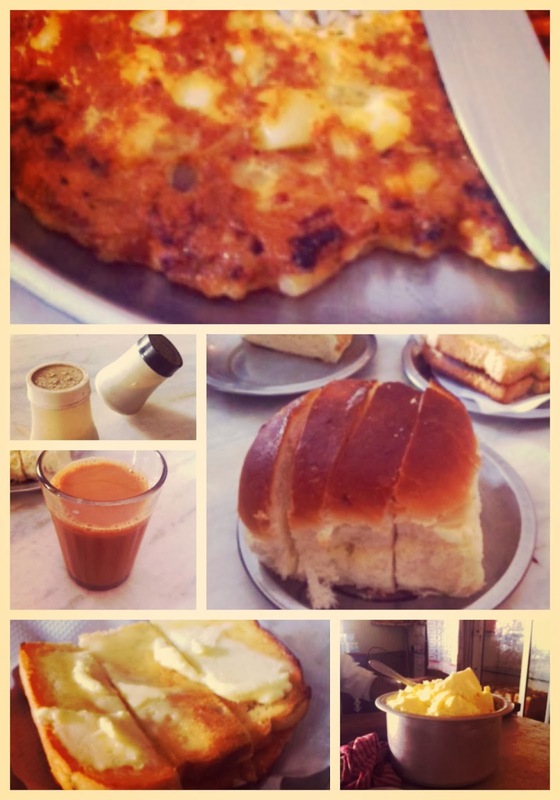 Those who've patronized his cafe, swear by the tea and cheese omelette the kitchen churns out. You can routinely expect a roar of laughter and chatter from huddles of men revelling in life's simple pleasures - chai and bun-muska post their morning work-out. I can't believe that despite having lived in Pune for several years now, it was only last week when I first visited the cafe even though I walked past it twice every day for 5 months, with chai and omelette-scented air wafting past me. Ambiance is not their forte. Neither is service. Don't expect to be heard or given a chair when the cafe is crowded. Also, they stay shut for most of the day, so wake up early one morning and plan a breakfast there. What you will enjoy with your tea, bread and omelette, is the vibe of the place. At Rs. 35 for a bun muska jam (bun slathered with lots of butter and sweet strawberry jam), it does cost a tad bit more than what other hole-in-the-walls would charge for the same. Go on an early weekend morning and you will be surprised with the crowd that greets you. Yes, it is possible to hear ka-ching from running a cafe like this; a cafe where the only investment daily is purchasing the simplest of ingredients, namely butter, bread, eggs, sugar, salt and cheese. Amazing, yes?